The QT-5100 BeltMic has a tough, composite, hard case with belt clip. 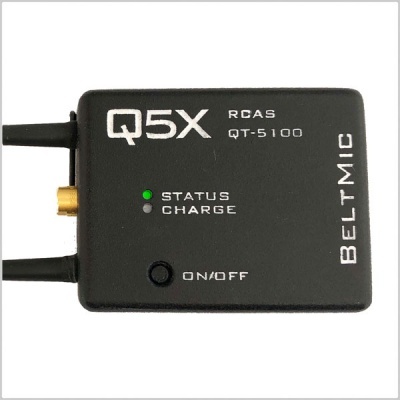 This transmitter is the RCAS enabled version of our worlds smallest belt mic, the QT-300 BeltMic. Weighing 57g and less than 1/2" thick, the QT-5100 BeltMic joins the QT-5100 series as the most comfortable audio transmitters in the industry. The QT-5100 Series utilizes the RCAS™ (Remote Control Audio System) a revolutionary way to remotely control transmitter settings from a central computer or hand held remote control. In an impact resistant, hard composite case. With an internal Li-ion rechargeable battery and Lemo connector for a removable Lavalier. The QT-5100 PlayerMic offers approximately 3,000 channels. It is tunable from 600 to 700 MHz in 25 KHz steps. The QT-5100 BeltMic has an impact resistant, hard composite case and features a super small form factor, making it incredibly easy to conceal on talent. 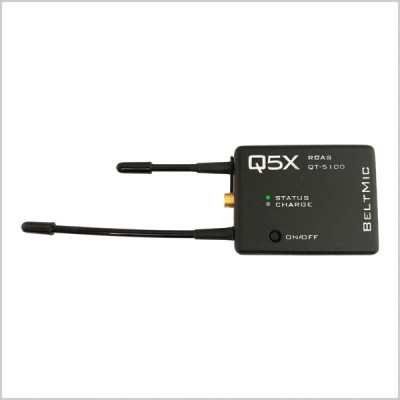 This provides excellent flexibility in where the transmitter can be placed, to capture the best audio possible.